I have a question about shooting slide film and estimating exposure when using natural density graduated filters. I currently use a Lee 100 filter system, including the Lee 100 hard edge ND grads. One method I use when shooting landscapes is to measure the sky with spot metering on the camera. Most often I simply use the 0.6 NDG and adjust the exposure by decreasing the shutter speed with 2 stops. If the measurement of the sky shows a shutter speed of 1/250, I put on the 0.6 NDG and set the shutter speed to 1/60. In other words I expose for the highlights, and hope that the dynamic range of the film (roughly 5 stops for slide films) will capture the foreground and also shadow detail. Another method of mine is to employ the matrix metering of the Pentax 67ii. With this method I simply position the 0.6 NDG in front of the lens, and let the camera work out the best exposure. I know that one can take a very scientific approach to exposure and ND grads, for instance with using a spotmeter and measuring a scene in great detail. My simple method can often result in successfully exposed slides, other times the slides can end up too dark or have other exposure problems. I would very much like to hear your views on my method for shooting slide film, exposure and ND grads. It would also be interesting to learn other ways of approaching slide film (maybe also digital capture), exposure and ND grads. I think in general, the idea is to meter without the grad first, targeting the darker parts. (eg ground midtones) so that they will expose correctly ....a sky would often blow out then. Then the grad is placed to bring the sky back down without changing the exposure, so the end result is less DR in total. Manual exposure works best for this control, of course. Thanks Nigel! I also meter without the grad, but I target the highlights. So my approach would possibly be the total opposite of the one you are outlining. A slide with blown highlights is ugly, but a slide with too dark shadows can possibly be "rescued" in scanning or even tolerated as is. 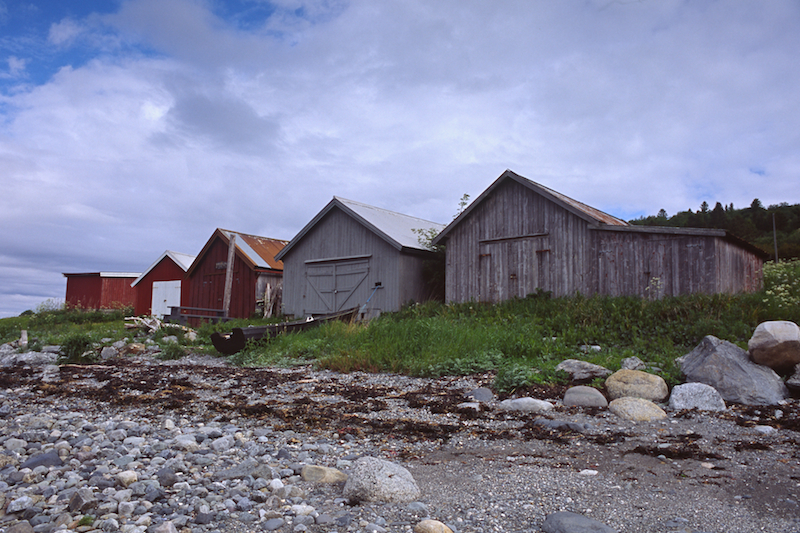 Here is an example of a Fuji Provia 100F slide taken with a 0.6 soft edge ND grad, and with my approach of metering the sky, and exposing for the highlights. Most of my grad use was done on 35m negs, so that's a clear difference of course, and I didn't scan or edit in those days, so the priority was to make the images bright enough ..... The grad had to hold the highlights by itself. Even so, I'd have thought on slide, don't you risk underexposure with a highlight metering approach, especially if you're then putting a grad on top? The shot above is 35mm Fuji Provia 100F, and I would believe there is clear difference between slide and negative film, like you point out. I have probably not been exact enough when writing about my approach in my first post, because I am having difficulties understanding your response. Maybe I could try once more. If I use the image above as an example: Lets say that I use a 100 ASA film, a metering of the sky (highlights) results in 1/250 and a metering of the foreground rocks (midtones) results in 1/60. In this scene I would have used a 0.6 (two stop) ND grad. Here it would make no difference if the metering of the sky was the target or the foreground rocks. If the sky had been brighter, and resulted in a metering of 1/500, a 0.9 (three stop) ND grad would possibly have been correct (if the forground rocks remained 1/60). When shooting in daylight and with the sunlight coming sideways or from behind (yourself), my experience is that the 0.6 ND grad will fit most contexts. I have studied the book "Transient Light" by Ian Cameron, and he writes that he uses his 0.3 ND grad 2% , the 0.9 ND grad 7%, the 0.45 ND grad 20% and the 0.6 ND grad 70% in his overall shooting. Well, I am trying to learn more about this subject, so any input is interesting. I could also be interested in books about photographic technique, where exposure and the use of ND grads is dealt with, so I would welcome suggestions about good literature on the subject. I see what you're saying now, sorry .. You mean that you are assessing the exposure difference between mids and highs in order to choose the correct filter ..... ? I was speaking at a tangent and looking at the actual targets of the camera metering , ie I thought you were actually exposing at the highlight metered EV. This I felt might risk underexposure. One very good book I can recommend is 'Perfect Exposure' by Micheal Freeman, which deals very will with questions of practical dynamic range assessment and exposure judgements. Thank you, I will check out the book! Bear in mind that it is digitally based, and it's central method is based around the DR of a digital sensor, so around 10 stops. However, there's no reason that you couldn't make mental adjustments for the latitude aspects and specific rated DR for any film.